When someone asks me “Why would anyone want a child to live with gay parents? Is that the right thing for them to learn what family is about from?”, I don’t hesitate to say “I’d rather they live with a gay couple who love them wholeheartedly and teach them how to be good human beings than have them raised by a straight couple who beats them or left in a foster system that provides them with no stability for their adult lives.” But after answering that last night, I had a bizarre dream that led me to think that it’s more than that. I never want a child to live in a family where they are so incredibly afraid and ashamed of their natural genetic disposition, that they kill themselves, torture themselves, or harm themselves and others with them just because a -parent- can’t deem them worthy of living. What is a parent? Really, let us delve into that core issue first. A parent. In the scientific sense, it’s a breeder, sure, but even science (particularly zoology) has also taught us that a parent is a nurturer who cares for its young without the prerequisite of having the exact same genetics. 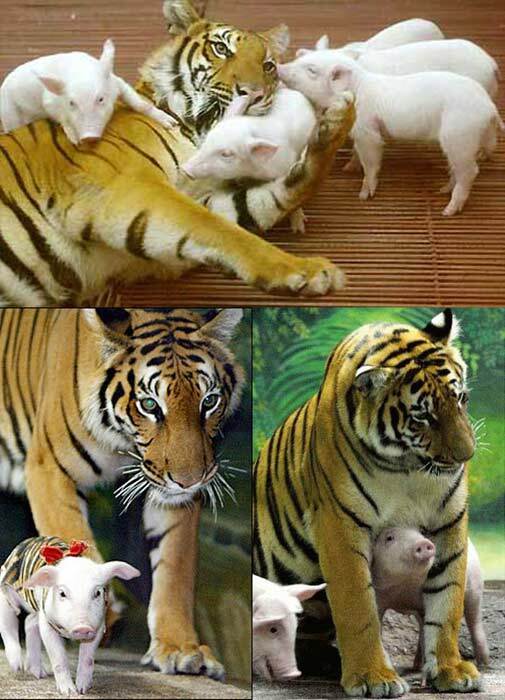 We’ve seen lions nurture gazelles, hippos raise pigs, pigs raise kittens, and so on. So, to base nature on the concept that being gay is not natural, and that a gay person does not deserve to exist among straight “normal” or “natural” people, is like saying “That lion is wrong for nurturing that gazelle.”. But what’s wrong with that statement? Here’s what is wrong with it. With that very statement, a human being has just asserted that the natural course to take is for that lion to eat that gazelle, and as that lion should eat that gazelle and eliminate it, it is therefore our responsibility as “straight humans” to eliminate gay humans. Pardon me, if I find that a tad animalistic, abhorrent, and ultimately inhumane in every sense. Human is to be humane, one would hope. So to eliminate other people because they just don’t fit with our “pack” is the exact opposite of being human. If it is the exact opposite of being human, then that would make us nothing more than animals inside. If it is to be believed that human beings are more advanced and skilled; intellectually and morally; than animals, then that would mean an animalist would not be natural. If a human being with an animalist disposition isn’t natural, we would be seen as having to eliminate it. And so it goes in this constant circle of who is more natural than who else, and ultimately we all end up dead because something, someone, who should have been a parent, a nurturer, chose to be an ‘unnatural’ animalist. Oh but wait, you say it isn’t a choice, to view gay people as unnatural and reject your own child? It’s the will of God? Interesting. Thou shalt not kill. Thou shalt not judge. So many different commandments that point out it isn’t our place to do those things. Most importantly, if you are an animalist, you aren’t capable of making the conscious decision to believe in anything beyond what you can see right in front of you, because it wouldn’t be natural. Are we sensing a theme here? I am. Stop using ‘NATURE’ as an excuse to alienate, reject, harm, or in any other way traumatize any other human being of any sort. Do not use nature as an excuse to keep a child from having a family. Do not use nature as an excuse to propagate your own fears and attach them to others. Do not use nature as the basis for any of your unnatural hatred. No one is saying anything about changing your way of life so that it fits in accordance with someone of a different disposition. What IS being said is that if you’re uncomfortable, get up and leave. You should not expect other people who are perfectly okay in said circumstances to change everything around them to appease just you. No matter what you THINK nature is. Because let’s be honest, you aren’t nature. You don’t speak for the earth, the sun, the moon, the stars, and if you believe in God, I hate to break this to you, but you don’t speak for him either. Don’t bring a book written by other human beings into it. Use your brain, your humanity, and your empathy to figure out where you really stand. You’re human. You’re in a human situation. Deal with it.